The Westport salmon opener hit with far less of a bang than we had hoped for, but with a few days behind us now it is still slow but improving. The opener for us was a frustrating day but we did catch fish and all in all it was a good day on the water. As with any opening day there is a ton of excitement but also a ton of unknown. The Commercial trollers had not been out in a few days nor had they had a lot of success either. These things combined had us guessing where to start. We chose to head slightly south of straight out into 200 feet of water a start. We hooked and released three Salmon for the day: two Coho and one just undersized Chinook. All fish came on bait. Day one was a dismal day for the entire fleet with probably less than 50 Salmon being taken. Wow! Bottom fish saved our first day with a limit of Rockfish and a few Lingcod. 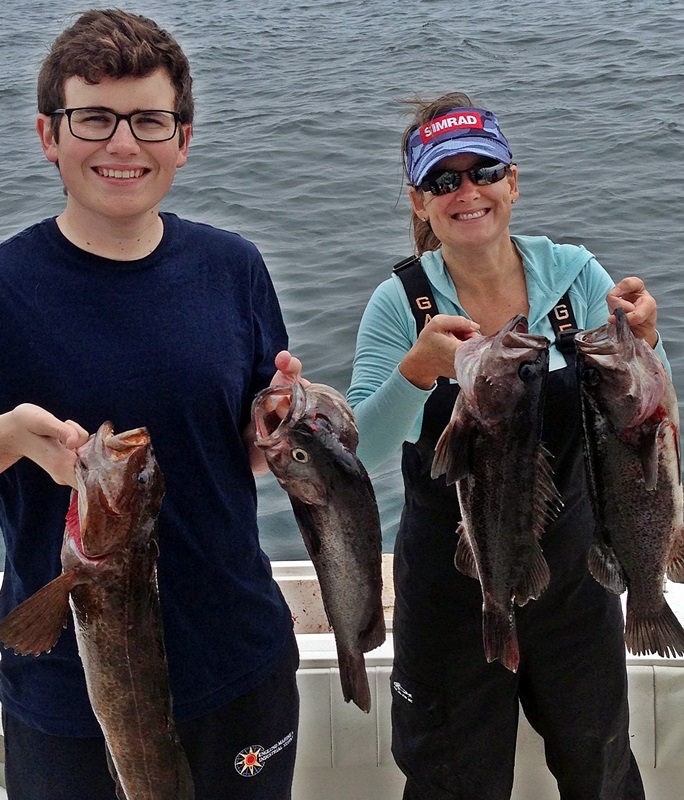 Cyndi and our son Matt were happy to have the main ingredient for Fish Tacos onboard. Jigs and whole Herring were the ticket for these fish. Day two for me brought a completely different story. The water was rough and the heavy mist made for a interesting ride out but once we arrived on the spot the fish were there. With heavy seas out of Westport we found it much easier to troll south, pick up, run back north, and troll south again. We hooked fish on a Diver and Herring combo, pictured here, and on a inline flasher/Anchovy combo off the downrigger. This weeks forecast is for good weather but fairly strong tides. 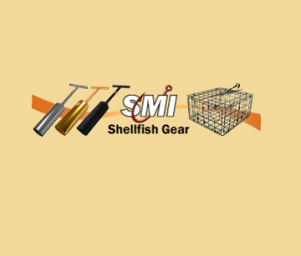 You should have ample opportunities to continue searching for fish. Looking back at last years log things were slow around this time as well. Seems like the 200 feet of water range is where they are hanging out and with a good weekend up in Neah Bay last week it tells me fish are on the way. 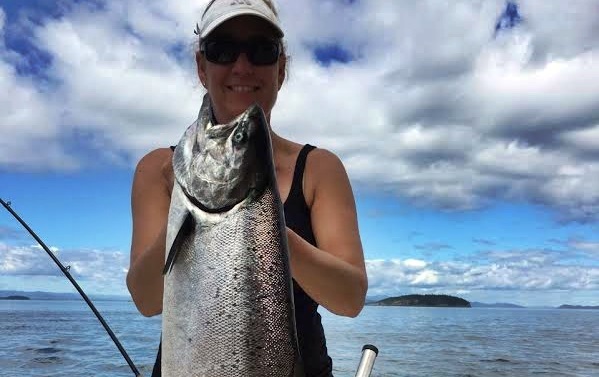 Vicki Klein with a nice Chinook, headed for the BBQ. 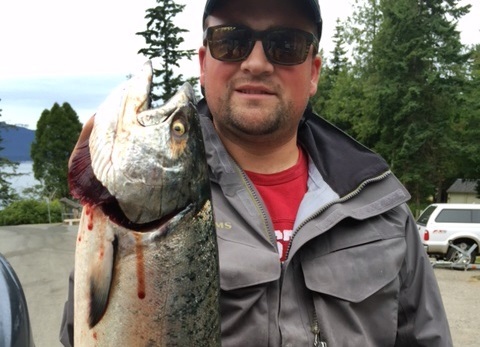 There were definitely some Chinook around for the July 1st opening weekend of Salmon fishing in the San Juan Islands. Silver Horde 3.5 spoons were the hot ticket for us. Tickets are on sale now for the 2016 Bellingham Derby, July 8th-10th. Better hurry! Read the regulations before you go. 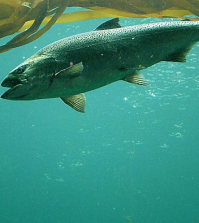 Two Chinook may be retained through July, but they must be hatchery fin clipped. 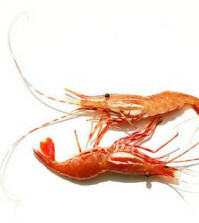 Prawns are still open, and crabbing begins July 15th. Can’t wait to get some fresh dungies! 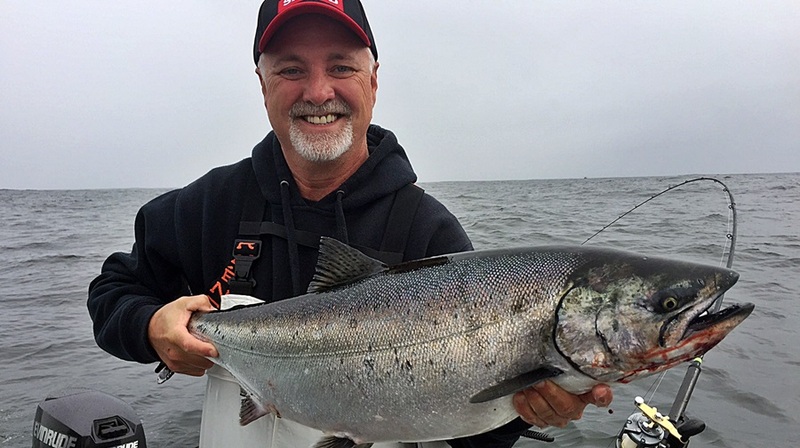 The Chinook salmon fishing has slowed some with the big tidal changes but there are still some nice Chinook being caught mostly at the Clay Bank to Shelf area while trolling flasher and artificial squid or a spoon. There have been Chinook caught Jigging or Mooching in the same area as well but lots of dogfish in the area right now. The Dungeness crabbing has been slow overall as expected with the best success locally in 120’ to 150’ of water and there has been some really large Rock crab being caught. For an updated report call 253-591-5325. 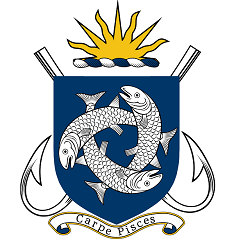 Crab fishing opened July 1 in Area 11 and is open in Area 13 currently. 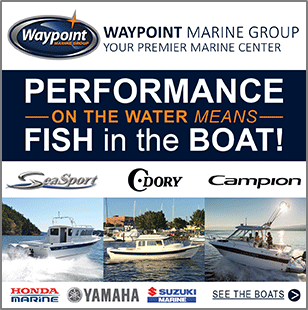 Point Defiance Marina has rental boats and motors and launch and overnight moorage facilities with pump out stations and shore power. In addition we have storage space for bouts up to 17 feet as well as kayak storage. For more information call 253-591-5325. Sails and Trails Camp for youth ….Have a youth ages 11-15 looking for a week long day camp that provides fishing, sailing, and kayak instruction as well as beach and trail hiking with marine and forest education. Check out the Sails and Trails Camps offered at Point Defiance Marina and Tacoma Youth Marine Center. Camps are M-F 8 am to 6 pm and are available for July 11-15, 18-22, or 25-29, 2016. For more information genea@tacomaparks.com or (253)591-5325. This is a great way to introduce teens to these on the water opportunities. Cost $250 per week session. As the weather remains hot and the water keeps getting warmer there is a heavy bloom going on. This will show up as an unpleasant odor in the flesh of the fillet. There is an answer as to how to deal with this. Several years ago my family was at the Mardon Resort for the week. My sons and I fished the dam face using Baby Hotlips and both the boys caught severely hooked and large trout that were bleeders and had to be kept. Back at the trailer we were just trying to figure out just how to cover up that odor in preparation. A neighbor from the next trailer spoke up with a solution. Fillet the fish to include skinning it and then place it in cold water with sliced up carrots and chill over night. The next day the fish fillets had a pleasant odor and did taste good. The carrots now had the smell and were tossed away. From that time on we always had carrots with us. With the water dropping the walleye fishing has been in 12 feet of water and lust outside of the dunes that will be starting to show. I also have reports of walleye being caught up in Linn Coulee. Largemouth are still being found up in the dune where ever you can find deeper water and cover. The dam will continue to turn out smallmouth. We have had success fishing in the boat and casting out towards the deeper water. Because of fire danger the roads providing access to many of the seep lakes have been closed to all travel and could be much of the summer. Both the roads to Soda and Corral lakes remain open. Today the winds are light but we have had some very windy days. The fireworks at Mardon on Sunday night were very good and viewed by many and very appreciated. Thanks to Mike and Marilyn Messeberg. Salmon fishing was SLOW. The Trap Shack, Beechey Head, and Aldridge Point were the most productive locations to fish. 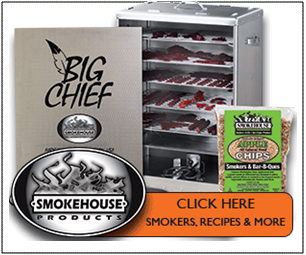 Most of the chinooks were running up to 10 lbs in size but there were few larger ones too. On Friday, a number of “oversize” springs passed through the area and some fish pushing 40 lbs were released. Anglers using bait are finding anchovies in glow teaser heads have been working well still. Spoons, such as the G-Force and Skinny G, in Bon Chovy or Outfittters colours were also effective. For flashers, the Purple Onion, Lemon Lime and Bon Chovi have been good. Very few halibut were brought into the marina. Salmon fishing was SLOW this past week. There are some fish in the area, just not too many of them. Anglers fishing with bait have been using anchovies or tiny strip in Glow teaser heads. Good trolling lures have been Coho Killers, Bon Chovi or Outfitters Skinny G spoons and APT Needlefish spoons. Drift anglers have been using Needlefish Darts or Deep Stingers. Halibut fishing was SLOW this past week. The halibut being brought in were ranging from 20- 40lbs with few exceptions. Anglers that were fishing were using extra large herring, salmon bellies and/or octopus for bait. Also working well was the 9” Jumbo Squid in Green Glow. Also working well, and discouraging to dogfish, was the 9” Jumbo Squid in Green Glow. Salmon fishing was SLOW this past week. There were salmon being caught inside the bay and by Church Rock. Ben Wright and his fishing partner Jason Casanova caught a 18 pound spring on anchovy with a “Madi” flasher and green glow teaser head off Church Rock. Anglers jigging near the mouth of the bay were also picking up springs, mostly on the small side. There has also been the occasional chinook that is over the slot limit size for retention. Flashers that remain popular include Glow Green, Lemon-Lime and Madi. 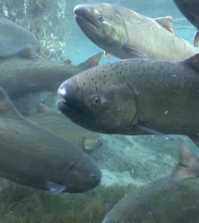 The salmon fishing remained SPOTTY for springs this past week. There are some oversize, unclipped springs in the area as well as some springs up to 20 lbs. 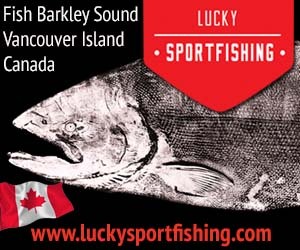 The top choices for Sooke anglers are the White Lightening or Irish Cream Coho Killers trolling behind the Madi or Bon Chovi Flasher. Hootchies in Cop Car, Purple haze and White have been effective in the past month. 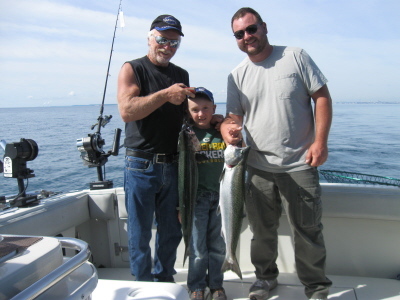 Anglers fishing off Sherringham Point, Otter Point and the Bluffs have had the most success this past week. Fishing for salmon was SLOW off Victoria. The best fishing was out at Constance Bank where a few fish were taken. Supposedly, a pair of 18 lb springs was caught close in along the waterfront. Anchovies were a good bait to use and Glow and Purple Haze have been the most popular colors for teaser heads. Spoons and squirts were successful in getting hook ups as well. Good choices in plastic baits are the Pink Haze and White Glow. Green Spatter Back UV Coho Killers, Gibbs Outfitters or Bon Chovi Skinny G trolling behind a Moon Jelly flasher has also brought results in Victoria. How: Mixed bag all week. Very consistent. The action and location has not changed. Chinooks and Coho have dominated the catch and lots of Rainbows too. Chinooks went for Magnum Reaper Fish n Chip spoons in chartreuse /silver. No Chinook over twenty pounds this week most averaged 12-18 pounds. White or green Howie’s flies also working well run behind a white flasher. The big Chinooks are active 90 down on downriggers. Reapers and Vulcans have been working for us. They have a Buy Four get one free special this season. The small silver Vulcan in green or blue has also been good on the downriggers. Run them 75 feet behind the ball 55 feet down to the bottom. Coho have been on standard size Howie flies. Running all wire divers now with a 1.5 set at 175 feet of line out. Lake Trout action picking up they were hitting the Chinook tackle.Brown Trout action was just ok on 2 color lead core with small spoons. One here and there on the Vulcan Silver Sky. Rainbow Trout were hitting Vulcan Dolphin Green and Silver spoons in the top 15 feet. Three and four color leadcore best. Speed: For all fish speed has been very critical with the warmer 65 degree water. The temp break to 57 is down 60 feet. I use the Depth Raider to measure speed and temp at the ball. The boat speed of 2.0 to 2.2 has been best. The faster speed triggered the Chinook action. Where: I fished mostly out over 70 feet again. East wind has pushed the warmer water in. Fish 70 to 170 feet. Near shore action on McKinley pier has been very slow with only a few Browns being caught. We did not get out over 140 feet of water yesterday. Head 55 degrees north in Whitefish Bay and set lines in 70 feet. Troll north east have a great fishing season. Let’s go fishing! Note We are offering an extra hour for $35 when added to a five hour fishing charter.